A full healthy hair of the head is a sign of youth and beauty. Who doesn’t want it? Hair problems become very common in this modern age. In the present time work pressure, stress and improper diet is a common thing. All these things will lead to hair problems. If you are facing this hair problem don’t worry, a slight change in your diet and few simple techniques will restore your lost hair again.Here I am sharing detailed information about hair problems like baldness, Greying of hair, hair loss, hair fall and dry hair. Baldness does not cause any physical pain. But it creates a lot of psychological problems, especially in women. This disease causes many psychological problems for a woman if they still not married. Baldness in young age is unbearable. Don’t worry here are few magical recipe that will remove baldness and promote hair regrowth. Lime is an excellent remedy for baldness. Take 50 grams of dried and powdered lime skin. Take 50 grams of powdered aerial roots of the banyan. Boil this mixture in coconut oil and filter it. Applying this oil prevents hair loss and promote hair growth. Take some lime seeds and black pepper. Apply this on the bald patches to stimulate the scalp and induce growth of hair. This simple recipe will remove baldness and stimulates hair regrowth. A fine paste prepared by pigeon pea or red gram regularly applied on bald patches will give good results. Regular use of castor oil as hair oil helps the luxuriant growth of the hair. Take lime seeds and black pepper seeds. Ground them to get a fine paste. Apply this herbal remedy on the patches. It is mildly irritant but increases blood circulation in the affected area and stimulates hair growth. The green paste should be applied twice a day for a few weeks. Baldness is prevented and start growing hair again by the treatment of Ayurveda. Ayurveda is a natural and efficient treatment.Hair fall begins when there is a significant health or psychological problems arise in life. Pigeon pea one of the best remedy for baldness. A fine paste prepared from the pulse of pigeon pea is highly effective in filling bald patches. It should regularly apply. Soak the pulse and grind it to a fine paste and apply it on the entire head. To get good result use it daily for a period. Bhringaraja oil is the drug of choice for the treatment of baldness.Mahabhringraja taila or Nilibhringadi taila are also useful. Any one of this is to be gently massaged over the affected area about one hour before taking a bath. By this massage some of the existing weak hair fall out, therefore, in the beginning, the hair will look thinner, and the baldness would appear as if increasing. You should not worry about this. This should be used consistently for about six months before any significant result could be achieved. Powder of bhringaraja can be taken to the orally.One teaspoon of this powder mixed with honey should be taken on empty stomach, twice a day. Elephant tusk is very popular for the treatment of baldness.The tusk is bunt to ashes and the ashes add with honey or ghee and apply it on patches daily will be useful. If baldness appears in young age, then Ashvakanchuki rasa should be useful and effective. According to Ayurveda, the main cause of hair falling is the weakness.It is advised to take a balanced diet.Butter, ghee, and milk should be included in the diet. Another helpful remedy for patchy loss of hair is the paste of licorice made from grinding the pieces in milk with a pinch of saffron. This paste is applied over the bald patches in the night before going to bed. Hibiscus is a common garden plant with a variety of flowers sure to attract everyone’s attention. Apart from providing beauty and elegance to gardens and backyards of houses, hibiscus has several medicinal properties. It is a handy medicinal recipe for problems like dandruff, hair fall, premature graying of hair. Hibiscus is consumed as hibiscus tea, available in the market. One can also prepare hibiscus tea at home. It is quite simple to make a cup of fresh hibiscus tea, which is consumed as a general health tonic to keep the physiological functions of the body in perfect condition.Take fresh flowers from a hibiscus plant and dry them under the sun. Crush them into a powder and keep it in a clean and dry bottle. Whenever you feel like taking hibiscus tea, take a teaspoon full of powder and add it to a cup of water. Boil the mixture, filter it and allow the hibiscus tea to cool. You may add honey or lemon or a bit of sugar to add taste. Ayurveda and Unami doctors recommend the use hibiscus tea early in the morning for a day-long feeling of good health. In India, there have been so many natural products.Which people are always using from the ancient times. If you have dandruff in your hair or itchy scalp then this very nice remedy. Take coconut oil about 50 ml and mix 50 ml of time juice. Take this mixture and apply to your scalp every morning for one week.You can see the dandruff is gone. If you want further more to prevent the itchy scalp you can use neem shampoo, it is very commonly available.Or you can find neem leafs, neem oil you can apply on the hair on the scalp very much beneficial for dandruff. If your hair dry and hair have split, then you can use very nice remedy at your home in your kitchen. Take some milk cream in a ratio of two parts milk cream, one part honey.Mix it nicely and just apply on the alternate day’s excellent remedy to nourish your hair. Also washing your hair with yogurt very nice, you can wash hair with yogurt then the hair will be excellent healthy and soft. In India there is very much use of certain herbs, one is called Amla, shikakai, and feet. If you are in India, you can find these three herbs.Take the powders and mix all the three powders in equal quantities and make a paste of it. Just nicely massage into your hair for few minutes and then wash the hair with warm water. This will help to prevent hair loss. In Ayurveda, we always say don’t put anything on your skin don’t rub on the skin, scalp which you cannot eat. So try to use more natural products. Don’t rub too many chemicals into the hair or the scalp or into the skin they can cause a lot of serious problems for your hair.Make your personality looks a little bit like you know. So good you might feel a little bit embarrassing because of hair even sometimes skin problems caused chemicals we used on hair. Some people get pigmentation even on the face because of the use of the chemicals. Aloe Vera contains anti-oxidant and anti-inflammatory properties. Skin rashes and other issues related to the sensitive skin can be treated with the gel extracted from this Aloe Vera plant. Massaging the Aloe Vera gel on the scalp helps to restore the PH balance and condition the hair properly.Aloe Vera capacity to trigger the formation of nitric oxide and the presence of an enzyme called superoxide dismutane in aloe vera makes it an ideal remedy for male pattern baldness. Sea vegetables or weeds are rich in minerals, vitamins and amino acids and have excellent curative powers. A vast majority of seaweed species are used by humans as health supplements, fertilizers and skin care lotions and creams. Seaweeds such as Himanthalia Elongata and Atlantic Kelp can be used to stop hair loss and foster hair growth.They can add lustre and shine to the hair by healing or reducing damages to the scalp and hair. Bengal gram: Washing the hair with Bengal gram flour keeps them clean, soft and free from hair diseases. BlackGram: Washing the hair with a paste of cooked black gram dhal and fenugreek lengthens hair, keeps them black and cures dandruff. Birch oil works well when mixed in with shampoo, and can also be mixed with other oils and applied to the hair or scalp. Birch oil is thought to support current hair growth, encourage new hair growth, and condition the hair against the elements. In addition to having a lovely smell, chamomile is thought to have many healing properties. Many holistic practitioners recommend an infusion of chamomile is used as a hair rinse after washing hair to soothe an itchy scalp, which is known to cause hair loss. Phaeophyta is a seaweed from which Channelled wrack is extracted. This herb contains powerful antioxidants and isoflavones that can be very helpful in renewing and refreshing the skin of the scalp.Channelled Wrack is particularly useful in curing hair loss among women. It improves hair thickness and hair growth. Coriander leaves Using the paste of the fresh coriander leaves on the scalp help sprout up new hair. Continue this treatment for about a month to discern the useful result. If green coriander is not available, you may use the pulp of the dried coriander seeds. Grind these seeds and apply the paste on your scalp for a fortnight. This is a tried and tested remedy for baldness. A typical oil of coriander is also prepared in following a way, which is very effective medicine not only for ensuring healthy hair growth but also for keeping the head cool and clear. Take about a kilo of green coriander leaves add, Half a kilo water and half a kilo sweet oil and boil together in a steel utensil. When the whole of the water content is brunt, leaving only oily substance, take it off the fire and add any permissible color if you want.. Using this oil for head massage bring benign coolness to the brain and head. You may use it to massage any part of the body if any burning sensation is felt. Massaging whole body with this oil in summers is very beneficial. Dong Quai is an ancient Chinese herb that is used to foster hair growth or stop hair loss. It is also known as Angelica. The phytoestrogens present in this herb helps in reducing the formation of DHT. Green tea has been used from time immemorial to reduce hair loss. By consuming green tea in capsule form or drinking at least 4-5 cups of green tea a day, you can reduce your risk of male pattern type baldness.The catechins present in green tea play a significant role in arresting hair fall and improving hair texture. Another powerful herb, Ginkgo Biloba is used for treating several issues such as skin problems and hair loss. Ginkgo is used for a variety of different things, including hair follicle stimulation. This herb is known to help with circulation-something very important to new and improved hair growth. It mainly cures these health problems by improving blood circulation to the skin and brain.A majority of herbal medicine experts who recommend this herb believe that the increase in blood supply to the skin and brain can nourish the hair follicles which in turn can lead to the re-growth of hair. Another powerful Chinese herb, He Shou Wu has also been used for centuries to control baldness and hair loss. It is one of the main ingredients found in many hair loss treatments and can be purchased in both capsule and tea form. This herb not only encourages the growth of terminal hair but also acts as a hair restorative according to a study published by American Botanical Council. Although this herb was used for a very long time to treat problems about the urinary system, its high silica content makes it an ideal hair loss remedy. Horsetail is increasingly being used in many hair care products of late to repair hair and stimulate hair growth.Whether used in tea, taken orally, or mixed in with shampoo, horsetail encourages hair growth. This herb is also an essential ingredient in many herbal products that are aimed at fighting pattern baldness. This powerful herb has been used in Asia for some years. This herb not only regulates cell metabolism but also promotes blood circulation. Ginseng can strengthen and nourish hair when used as a tonic or shampoo. The hair loss drugs or herbal remedies will have any one or more of the herbs above as its main ingredients. While some of these herbs may be very effective for some, it may not yield the desired results for others. Pygeum can be consumed in a capsule or pill form. It is extracted from the tree’s bark and works just like green tea. This herb has been used as an ingredient in many hair care products such as hair restorative shampoos and oils. A few drops of any of these products can be massaged directly into the scalp to stimulate the hair follicles and promote hair growth. Peppermint oil is also a good scalp stimulator but must be diluted before application. Mix 3 drops of peppermint oil with three teaspoons of water and massage into the scalp. This herb has many different uses and is frequently associated with hair growth. It is thought that rosemary can help to make hair sleeker and shinier, and also contributes to combating dandruff, which is known to cause and accelerate hair loss. You can either include more rosemary in your food, or you can create a hair rinse from rosemary leaves be simmering the leaves in water for 10 minutes. Throw away the leaves, pour the cooled rosemary water over your hair, and then rinse it out with fresh water. Saw palmetto finds use in several hair loss products and remedies. This herb can be used to reduce hair fall and foster hair growth. This herb is also immensely useful in treating prostrate related problems. Saw Palmetto capsules should be avoided by nursing or pregnant women.Sesame Seeds. Crushed leaves of sesame are considered beneficial in the treatment of dandruff. A decoction made from the leaves and root is used as hair wash. It I s said to prevent premature graying of hair and promote their growth. here is a simple remedy that will act as a hair tonic. Indian is well-known for enriching hair growth and hair pigmentation. The fruit cut into pieces is dried preferably in the shade. These pieces are boiled in coconut oil till the solid matter becomes like charred dust.This darkish oil is an excellent oil to prevent graying. The water in which dried Indian gooseberry pieces are soaked overnight is also nourishing to hair. This water should be used for the last rinse while washing the hair. By preventing the conversion of testosterone into DHT, this herb prevents hair loss among men. This herb imparts several benefits when used along with pygeum or palmetto. You can purchase this herb in either capsule or pill form. Hair loss, in general, can be stopped or reversed at home by taking some simple steps. However, in the case of chronic alopecia, expert guidance is required which has been described in the ‘Treatment’ section of this article. 1.The first step is to locate the cause in your diet or lifestyle that is causing the pitta dosha. Once you find it, try to give up or at least reduce the diet, habit or activity responsible for increasing pitta. 2.Always use a natural shampoo or soap (without too many chemicals) to clean the hair.3.Oiling and massaging of the scalp is highly beneficial in preventing hair loss. Use coconut oil or mustard oil at least three times in a week. Certain medicated oils like Mahabhringraj oil, Amla oil, and Arnica oil are also very useful. 4.Ensure regular bowel movement every day. In the case of constipation, a mild natural laxative may be taken. One teaspoonful of Triphala powder can be taken at bedtime with warm water. Dandruff will damage the hair also leads to hair loss and baldness. Nothing to worry here is a simple recipe that will remove dandruff instantly. Fenugreek seeds are helpful in the removal of dandruff. 1.Take two tablespoons of the fenugreek seeds. 2. Soak it in water for overnight. 3.In the morning ground the softened seeds. 4. Apply the paste all over the scalp and left on the head for half an hour. 5. Then wash the hair thoroughly with soapnut solution or shikakai. The paste of fresh leaves of fenugreek applied over the scalp regularly is also useful in dandruff. As none of the above solutions gives hundred percent warranty, the best thing to do is try this proven natural remedy that stimulates hair growth. It’s not only convenient and easy to make, but also very cheap cost. Mix all these ingredients in a bowl until they are well blended. Apply the solution to your scalp and hair roots massage gently. Implement the rest to the entire to your hair length. Cover your hair with a shower cap. Let it act for three hours. Wash your hair as usual. Repeat these remedy twice a week for two months. The results will amaze you. Castor oil is one of the most useful natural remedies for the treatment of receding hair. It has high antibacterial and antifungal properties that make it extremely efficient against dandruff, scalp infections, and folliculitis. The ricinoleic acid in castor oil stimulates blood flow to your scalp thus healthy hair regrowth. According to the studies, castor oil can stimulate hair growth up to three to five times. Moreover, egg yolks are rich in amino acids and proteins, both of which improves fast and healthy hair growth. Plus, it also abounds in biotin, which regenerates hair follicles. An efficient antioxidant with powerful anti-microbial and anti-fungal properties, honey, is another excellent tool that prevents hair loss. Plus, it makes an excellent hair conditioner due to the wax it contains. This natural hair-growth recipe is worth trying! You may check out my detailed post mudra for healthy hair to know more. Dandruff is the major cause behind hair fall. The hair tonic that has been using in Kerala from the ancient times. 1. Dried Indian gooseberry 10 Nos. In an Iron, pan pours half cup water and add Indian gooseberry powder and cook it. After that add Mehanthi, egg white, curd, and lemon juice. In this mixture add half glass boiled tea and keep it for one day. Apply this mixture on the head and wash it with shampoo after 15 minutes. This hair tonic will remove dandruff in the first attempt. There is no doubt; our hair is the most prominent feature on our face. However, regular hair treatments such as blow-drying, dyeing and straightening significantly affect our hair quality making it appear dry and damaged. If our hair is starting to lose its shine and volume, we have an efficient DIY recipe that stops hair loss and promotes healthy hair growth. On the plus side, it only takes a couple of uses for first results to be seen, and if we continue using it for a month, our hair quality will improve significantly. Mix all ingredients in a 1l bottle. Shake well so that the ingredients blend thoroughly. Apply on our hair and scalp as when we regularly wash our hair. Massage gently. Leave it on for several minutes then rinse our hair. Alternatively, we can use a dry hair mask, but it is not compulsory because the DIY shampoo already contains castor oil, nettle and AD drops that target hair dryness. Make sure that you shake well before each use. Including nettle tea into our diet is also recommended because this tea increases our blood count along with balancing our hormonal levels, both of which lead to hair loss. What makes this shampoo so efficient? The incredible health benefits of this shampoo are the result of the high medicinal properties of its ingredients, which combined, provide a natural vitamin boost for your hair and scalp. Nettle: This plant is one of the best natural remedies for hair and scalp health. For one thing, it improves blood flow to the scalp, thus stimulating hair growth. Panthenol: The pantothenic acid, also known as vitamin B5, supports hair regeneration and healthy scalp. Castor Oil: Rich in ricinoleic acid and vitamin E, castor oil is another excellent natural remedy that supports healthy hair growth. Plus, its antibacterial and antifungal properties prevent scalp bacteria proliferation as well as the formation of dandruff. Red chillies are very useful in preventing hair loss and promoting hair growth. Capsaicin in chillies acts like cantharidin. Four red chillies boiled in 500 ml of coconut oil can apply to hair. Its regular use increases hair growth and keeps them soft. When the leaves are boiled in coconut oil till they are reduced to a blackened residue. The oil forms an excellent hair tonic that stimulate hair growth and retaining normal pigmentation. Fenugreek seeds are useful in the removal of dandruff.Two tablespoons of the seeds should be soaked overnight in water.In the morning the softened seeds should be ground into a fine paste.This paste should be applied all over the scalp and left on the head for half an hour. The hair should then be washed thoroughly with solution or shikakai.A paste of the fresh leaves of fenugreek applied over the scalp regularly is also useful in dandruff. There is many herbal remedies and natural home remedies for hair growth. I am shared many articles on this subject but here I am sharing natural hair tonic from a spice.Red Chilies have been found useful in preventing loss of hair and promoting hair growth. Capsicin in the chilies acts like canthridine. Red chilies boiled in coconut oil at the rate of one chili per 120 ml of oil. This oil should be applied to the hair. Its regular use increases hair growth and keeps the soft. Hair fall is a common problem in young people of the modern age. In Kerala we are using two herbal oils that are very much beneficial in preventing hair fall and helps in regrowth the hair. All the ingredients powdered and boiled in coconut oil. After cooling the oil keep it in a container. Apply it daily for three month to get best results. How to prepare all the above ingredients powdered and boil in coconut oil. After cooling keep it in a container and apply 10 minutes before bath daily. With in a month you can see good results. One of the most important vitamins for health hair is vitamin A. Out of all of the vitamins on this list, it does the most amount of work. It contains antioxidants that work to condition and moisturize the sebum in the scalp. It will fight the free radicals such as pollution that weight down your hair and make it weaker. As a result, your hair will feel lighter and have better body. It will strengthen and thicken your curls so that they will grow longer faster and break much less often. Daily dosage: Do not exceed 2,000mg per day if taken as supplement. When we say complex, we mean that it contains every sort of vitamin B available on the market, including vitamins B6, B12 and biotin. Although the B class vitamins are great on their own, they are a true powerhouse when grouped together. B Vitamins are also significant nutrients in maintaining healthy hair. Deficiency of Vitamin B1, Vitamin B2, Vitamin B3 and Vitamin B5 is a contributing factor to the undernourishment of hair-follicle cells. Vitamin B9 present in low levels in human body causes decreased cell division and growth of hair follicles. The major symptoms of B9 deficiency are anemia, fatigue, apathy and graying hair. Researches and studies have revealed the significance of biotin in supporting hair follicles nourishment and preserving strength, texture and function of hair. Vitamin B3 (niacin) – Do not exceed 35mg per day. Pantothenic acid (vitamin B5) – Do not exceed manufacturer’s dosage. Pyridoxine (vitamin B6) – Do not exceed 100mg per day. C Vitamin for hair plays an essential role in producing and maintaining healthy collagen. Collagen is a connective tissue present in the hair follicles and keeps the hair intact. It also works as an excellent antioxidant and protects the cells found within hair follicles from the harmful effects of free radicals. Hair care vitamins in the form of Vitamin E aids in maintaining the integrity of hair follicles cell membranes and also act as a powerful antioxidant. Daily dosage: Do not exceed 2,000mg per day. Your curls will be softer and nourished so that you’ll get less frizz and more curls. You’ll get fewer split ends so that your hair will be healthier looking. Foods that contain vitamin E include nuts, spinach and tomatoes. Daily dosage: Do not exceed 1,000mg per day. Vitamins for black hair are useful for preventing black hair problems like dryness, breakage and hair loss. These black hair vitamins are responsible for healthier hair, providing moisture and faster growth. Vitamins for thinning hair boost your hair growth and prevents from hair loss. Thinning hair vitamins like Vitamin A and Vitamin C are responsible for adding volume and moisture to hair. Best vitamins for dry hair are Vitamins E and B-complex. Vitamin supplements like maxi hair vitamins, nioxin hair vitamins, phyto hair vitamins, pro vitamin hair serum and ultra hair vitamins are best for preventing various hair problems like dandruff, hair loss, hair breakage, weak follicles, dry hair, split ends and hair thinning. These vitamins revitalize hair follicle and provide new strength to produce, strong, healthy and shiny hair. Apart from a range of vitamins, there are many minerals like sulfur, selenium and calcium that are required in sufficient amount for maintaining good hair health. Vitamins and minerals for hair are supportive in addressing a variety of hair concerns from slow hair growth to thinning of hair. So, consume an adequate amount of required vitamins in any form, either natural food sources or supplementations. The paste of henna leaves, boiled in coconut oil to get a darkish oil, is very useful hair dye to blacken grey hair.The paste itself can be applied to the hair and washed away after a few hours to dye the grey hair. Washing the hair with concentrated twice a week is also considered useful in colouring grey hair to brown or black. 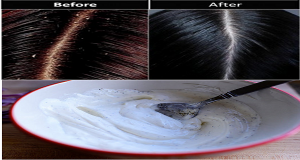 Herbal hair dye is not injurious to hair like chemical based hair dye.And herbal hair dyes are very useful in not only colour but also to improve the strength of hair.This hair dye is a home made and very easy to prepare and use and herbal hair dye will prevent hair loss. The greying of hair is known as palitya in Ayurveda. Each hair has a root, a stem or a shaft and sprouts from the base of the scalp. The stem varies greatly in thickness, from person to person. What is strange is that it is rounded in normal straight hair while curly hair has an oval or flattened section. The different color of the hair is caused by pigment scattered in varying amounts throughout the hair. In the absence of pigment in the cortical layer of the hair that majes the hair clear( or grey).What exactly is the reason for the lack of pigment formation is a mystery. 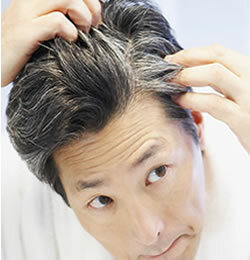 About 88% people claim to have some grey hair by the time they are 40. of that some 1% suffer from premature greying. A lot of it depends on the genes of a person. Some people are genetically prone to premature greying, while others may not grey till a later stage. Regional factors like food habits and weather also have a bearing on the greying of hair. High levels of stress and anxiety coupled with a fast pace of life may also accelerate the process. Let us see what ayurveda has to say about the process of greying. According to Ayurveda excessive passion, anger and psychic strain results in greying of hair. Persons with pittika type of constitution are prone to be affected by this ailment. Person suffering from chronic cold and sinusitis and those who use warm water for washing their hair are more likely to be cictims of this condition. According to naturopaths, premature greying can be an outward sign that something is wrong with the internal balance of the body, and that a number of lifestyle factors can contribute to the process of greying. These include factors like stress, alcohol consumption, smoking and recreational drugs because these lead to a build up of acidity in the body tissues, which makes it difficult for the body to process the B vitamins efficiently. These vitamins are directly linked to hair color and the important for the creation of color pigmentation cells. High levels of stress can contribute to the premature greying of hair sudden shocks can also accelerate the process since people under stress use up more B vitamins. How to Retard the Greying Process? This is a question most of us would like to have answeres to. Apart from using hair dyes, there are hardly any other remedies to the greying syndrome. But there are many medicines prescribed in Ayurveda that are said to arrest premature greying of hair. Take one-teaspoonful of Amrita(giloya), amla and gokhroo mixed in equal parts to which honey is added, thrice a day. Grind into powder two parts of Bhringaraja, one part of back sesame seeds, and one part of amla.Take a teaspoonful of the powder with milk and sugar. This however has to be continued for some months before the effects are visible. For the impatient who want faster results, swarnamaklshika Bhasma may be added in 240 mg doses with teh powders. Use Bhringaraja Taila(Hair oil) regularly.Eladi Taila can also be used for massaging the scalp. Grind into paste equal quantities of old mandur, amla, and Jaba(Hibiscus rosa sineusis) Flowers and apply it on the head. After the paste dries, wash hair with water in which amla has been soaked overnight. Grind together into fine powder Amla-2 parts, harada-2 parts bahera-1 part, stone of mango-5 parts, and old mandur-2.1/2 parts. Make a paste of a teaspoonful of this, powder with water in which amla has been soaked overnight.Keep this overnight in an iron vessel and apply it to the hair in the morning. After it dries, apply oil to the hair and then wash throughly. animal fats and eating a diet rich in alkaline foods such as carrots, celery almonds, figs, endive, fruit, green vegetable and wheat-gras. One also has to make changes in the lifestyle, whcih include giving up smoking, improving the diet etc. You can slow the greying process and even restore the hair to its natural color through these changes, claim naturopaths. They alsp feel that there is a definite link between the deficiency of B vitamins and greying. Diet has a very important role in preventing and arresting premature greying of hair. Eating a lot of fruits and vegetables is absolutely essential to facilate the supply of essential vitamins and minerals. Since the link between lack of B vitamins and greyng has been established almost definitely, it is neccessary to consume foods that provide these vitamins. Foods like wheat germ and pulses, whole grains, brewer’s yeast, nuts, fortifies breakfast cereals, liver, milk, kidney, diary products, wheat bran, wheat germ, eggs, peanuts, legumes, meat and fish, dark green leafy vegetables, avocados, walnuts, pork, poultry, bananas, and potatoes ehich belong to the B vitamin group, should be taken in plenty to retard the greying process. Where it is not possible to condujme a diet rich in these vitamins, a supplement containing B vitamins can be taken daily. In order to compensate the shortfall.But one has to keep it mind that the supplement should contain all the vitamins in the B group. There are few gifted techniques from the ancient Rishis, to deal with issues like these. In the present conditions, these resolutions are highly favorable. Sphaeranthus hirtus or Sphaeranthus indicus is one of the best plant herbs to treat white or graying of hair. It is a weed, and the common name of this plant is East Indian Globe Thistle. The leaves of this plant spread over the ground with aromatic smell. The flowers of this plant are violet in color. The oil made from these herbs works efficiently in dealing with whitening or graying of hair. Take around 300 grams of fresh Sphaeranthus hirtus flowers. Gently grind these flowers, put them in a bowl with and add one liter of water. Stir the mixture and put it on the stove under mild heat or temperature. Heat it until there is a decoction of around half a liter. Later extract the juice from the pulp. Add a ¼ liter of sesame oil to the extract. Put the extracted liquid on the stove with low temperature, until there is a liquid of ¼ liter left in the bowl. Once done Filter the oil and store it in a glass jar. Drop three drops of liquid in each of the nostrils in the morning before brushing the teeth. Repeat the same procedure before dinner with 1 hour in advance. Depending on the age group, a quarter or a full teaspoon of this oil can be taken orally. Ensure that the oil is taken on an empty stomach. Applying the oil directly to the hair also helps in dealing with white or gray hair problems. Do not take tamarind or other sour foods during while treating with this oil. Please consult a specialist in advance and case of any reactions. According to Ayurveda excessive passion, anger and psychic strain results in greying of hair.Persons with the paittika(pitta) type of constitution are prone to be affected by this ailment. Persons suffering from chronic cold and sinusitis and those who use warm water for washing their hair are more likely to be victims of this condition. Bhallataka is one of the popular drug to prevent greying of hair.This has a slightly allergic effect.Therefore, you must be care full before using it.This is given to the patient in the form of a linctus in a dose of one teaspoonful twice daily followed by milk.After confirming you had no allergic effect, you can use it one teaspoonful twice daily and take one glass milk immediately. You should go to bed early and stay away from worries, anxiety and passion.If you had the problem of cold or sinusitis, you have to take treatment of it.Hot water bath should be avoided.The cold water bath is the best. Bhringraja and Amalaki are popularly used for the treatment of this condition.You can use medicated oil prepared by boiling these two drugs or Maha Bhringaraja taila may use to externally for massaging the head.You can also use the powder of these two drugs internally in a dose of one teaspoonful three times daily with milk. It is very much beneficial if you can take a one-month exclusive milk diet. There is an alternative medicine which is used for inhalation.An oil prepared from the seeds of neem tree for inhalation twice a day for about a month with milk diet. These alternatives medicines will be effective only when you observes diet restrictions.As far as possible.you should take milk and sugar in major part of the diet.Salt should be avoided, sour things like curd are not useful. Graying of hair is a common diseases in the new age life style.In modern age few person are suffering from it even in the age of 15.This is considered as a morbidity, In Ayurveda this is called palitya.Graying of hair generally considered as a sign of old age.. According to Ayurveda excessive passion.anger and psychic strain results in graying of hair. Persons with paittika type of constitution are prone to be affected by this ailment. A drug popularly used for this condition is bhallataka. This has a slightly allergic effect. Therefore, it has to be processed carefully before use.Normally this is given to be the patient in the form of a linctus in a dose of one teaspoonful twice daily followed by milk. The patient should not remain awake for a long time at night and should be kept free from worry,anxiety and passion.If suffering from cold and sinusitis,prompt and careful treatment should be given.Hot water should never be used for bathing. Bhringaraja and amalaki are popularly used for the treatment of this condition.Medicated oil prepared by boiling these two drugs,viz,maha Bhringaraja taila is used externally for massaging the head.The powder of these two drugs is also used internally in a dose of one teaspoonful three times daily with milk. The oil prepared from the seeds of the neem tree is used for inhalation twice a day for about a month.Along with this the patient should be advised to take only milk as his diet. These therapies will be effective only when the patient observes diet restrictions.As far as possible,he should take only milk and sugar.Salt should be avoided.Sour things like curd are not useful. Premature hair is one of the major problems in youth. How to retard the graying process? This is a question most of us would like to have answers to. Apart from using hair dyes, there are hardly any other remedies to the graying syndrome. But there are many medicines prescribed in Ayurveda that are said to arrest premature graying of hair. 1. Take one teaspoonful of Amrita(giloya), Amla and gokhroo mixed in equal parts to which honey is added, thrice a day. 2. Grind into powder 2 parts of Bhringaraja, 1 part of black sesame seeds, and 1 part of amla. Take a teaspoonful of the powder with milk and sugar. This, however, has to be continued for few months before the effects are visible. 3. For the impatient who want faster results, Swarnamakshika Bhasma may be added in 240 mg doses with the powders. 4 Use Bhringaraja Taila( hair oil) regularly. Eladi Taila can also be used for massaging the scalp. 5. Grind into paste equal quantities of old mandur, Amla, and jaba(Hibiscus rosa sineusis) flowers and apply it on the head. After the paste dries, wash hair with water in which amla has been soaked overnight. 6. Grind together into fine powder amla-2 parts, harda-2 parts bahera-1 part, the stone of mango-5 parts, and old mandur-2.5 parts. Make a paste of a teaspoonful of this powder with water in which Amla has been soaked overnight. Keep this overnight in an iron vessel and apply it to the hair in the moring. After it dries, apply oil to the hair and then wash throughly. The naturopathic solution to the problem lies in creating the right PH or acidity level in the body. This means reducing the intake of meat and animal fats and eating a diet rich in alkaline foods such as carrots, celery almonds, figs, endive, fruit, green vegetable and wheat-grass. One also has to make changes in the lifestyle, which include giving up smoking, improving the diet etc. You can slow the greying process, and even restore the hair to its natural colour through these changes, claim naturopaths. They also feel that there is a definite link between the deficiency of B vitamins and graying.